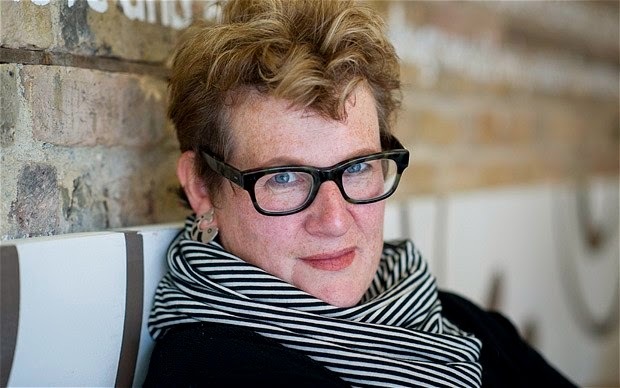 On May 21st Meg Rosoff gave two workshops on voice to 50 girls at The Hewett School, Norwich, as part of our young women’s writing project which is supported by the Co-op Community Fund. Meg kindly agreed to be interviewed by Eve, Grace and Mollie in her lunch-break between workshops. Eve, Grace and Mollie then wrote the interview up for us to post on our blog. Many thanks to Meg and the girls for the lovely piece. We enter the Hewett School Library to find Meg sitting at the table, laid with lots of food. When she saw us she quickly swallowed what she was eating and ushered us to come and sit with her. Earlier she informed us that she is 57, she has cropped hair that is chestnut brown, she wears stylish black glasses and dresses in an informal, relaxed, laid-back sort of way, very much like her personality, later on, though, she told us that appearances don’t matter. She kindly offered us all a cake and we obliged happily, and started our interview. Although she has been in England since she was around 20, she has still maintained an American accent. We thank her for her answer and proceed. We look at her with sympathy, but let her carry on. She looked at us, to make sure that we were paying attention, pleased she went on. “Hmmm” she thinks devouring the question like a sweet. “Sally Gardner.” (Author of the costa children’s book award 2012’s Maggot Moon.) “Sally Gardner is my saviour.” She announces matter-of-factly. Unfortunately then the bell rang and we thanked Meg for all her time and help and left. Overall we think that Meg Rosoff is an amazing person as well as a hardworking author and it was a privilege to meet her! By Eve, Grace and Mollie.